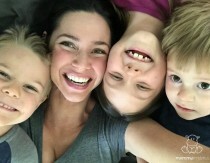 Heather Dessinger 103 Comments This post contains affiliate links. Have you ever wandered into a liquor store with a toddler in tow at eleven in the morning, plopped down half a gallon of rum on the counter and smiled? It yields quite an interesting response, I assure you. Of course, I had **slightly** different plans than the cashier guessed – homemade vanilla extract! Not only is it more delicious than store-bought, it’s far more affordable. I’m planning to give some away for the holidays this year along with homemade lotion bars and a few other goodies I’ll be sharing with you. Now, if you love the idea of a handmade holiday season but dread the thought of a bunch of unfinished projects, this is the tutorial for you! Just a few minutes of your time now + at least six weeks for the extract to ripen = amazing homemade gifts that will bring warmth and joy to your holiday events. All for a fraction of the cost of other goodies, of course! Vanilla Beans – I found this variety set of 40 vanilla beans for $19.99. That’s $0.50 each. 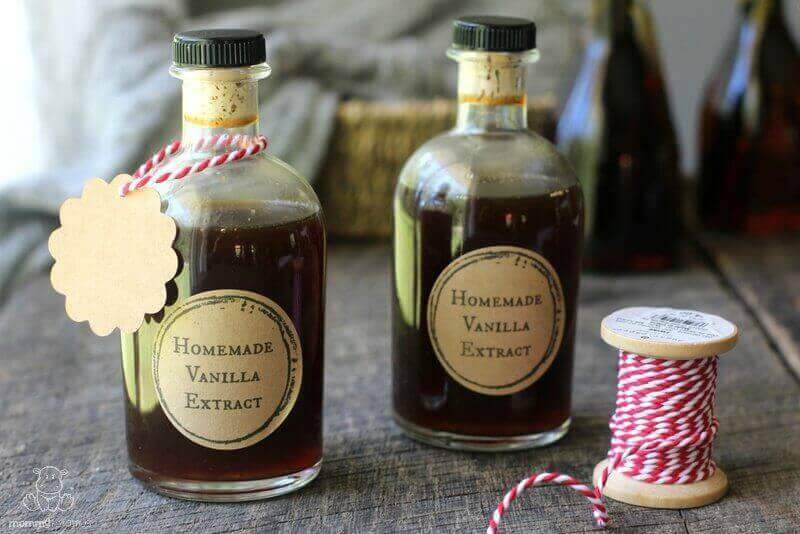 I love giving homemade vanilla extract in gorgeous bottles that can be repurposed later on. Although it’s ideal for the vanilla to be completely ready when given, sometimes it’s not practical. If the extract needs a few more weeks, I sometimes give it with “Open me on November 1st” (or whatever date is appropriate) written on the tag. Regarding packaging, here are three of my favorite options. 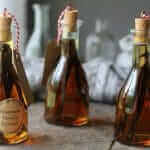 The recipe below will make two bottles of vanilla extract using the bottles in the above photo . If your vanilla beans are not completely under the rum, vodka, etc. after you place everything in the bottle, add enough additional liquid to cover them. I hand-cut the tags out of thick brown kraft paper based on the shape of these tags, but you can find similar pre-made ones on Amazon. Here’s one option, and here’s another one. I usually trim a little of the length off because I prefer them a bit shorter. The recipe from this book will make two bottles of vanilla extract using these bottles. Just like with the bottles above, if your vanilla beans are not completely under the rum, vodka, etc. after you place everything in the bottle, add enough additional liquid to cover them. Some types of alcohol used to make vanilla extract – vodka and bourbon – are sometimes made from genetically modified corn and/or enzymes derived from genetically modified organisms. (source) Manufacturers claim that none of the genetic material makes it through the distilling process to the final product, but to my knowledge that has not been independently verified. Organic options are hard to find, but there are certain sources that are still likely to be GMO-free. If you’re looking for vodka, Absolut says they’re non-GMO. For bourbon, here are a few brands to consider. Rum, which is derived from sugarcane, would not contain genetically engineered ingredients unless they come from enzymes used in the fermentation process. I contacted one brand, Appleton Estate, and they confirmed that their products are non-GMO. 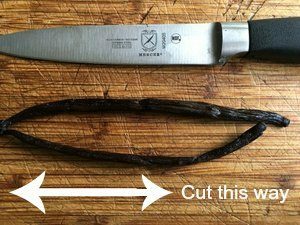 Optional Step: Some extract makers choose to split the vanilla bean lengthwise to accelerate the infusion process, while others avoid this step because they feel it makes the extract a bit more cloudy. I've tried both methods and think they both deliver excellent results, so choose whichever approach you prefer. 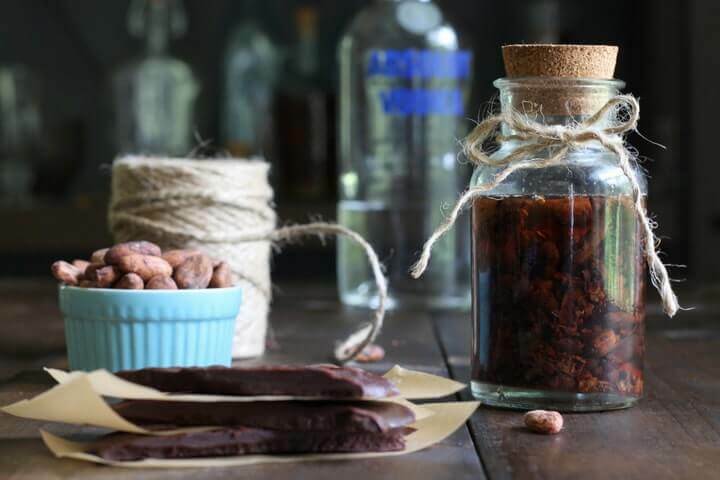 Place vanilla beans and liquor in a container, seal tightly and give it a good shake.Store in a dark cabinet for at least 6 weeks, shaking occasionally.When the extract has reached the depth of flavor that you prefer you can remove the vanilla beans to be used in a recipe. However, it is also fine to simply leave them in. Store in either a dark container or in a dark cabinet. I found an organic vodka that I am going to make vanilla with. Ocean Vodka is made from sugar can and good mineral water. It is a new company, I was at their “plant” and saw the cane sugar growing. Ohhh, thanks for the tip Melinda! Is there a shelf life on the extract? Heather, I have made my own vanilla before but found that 6 wks was not long enough. Not sure if that was because of the liquor that I used (bourbon) I think or what. It was good but tasted to much like the liquor but after about 3 mos it was wonderful. Need to make more for I am almost out. BTW, my beans are still in the bottle. lol Have you ever had that happen? 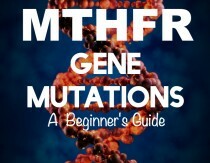 Thank you for sharing your recipe for vanilla along with information (and source links) about GMOs. It is nice to see that information side-by-side with recipes. Can you please provide a resource link for those adorable bottles. Hi Chandelle! I bought them at World Market. They also carry Weck canning jars at decent prices. Mine still tastes so strongly like vodka. I got expensive vodka because I needed it gluten free. I use it for cooking but I am hesitant to use it in frosting (or anything that I don’t bake). It’s been a few months. Does that taste/smell ever go away? Hmmm, I haven’t had that experience so I’m just guessing here, but it might help to add a few more vanilla beans. Sometimes if they are a little on the dry side they may not impart as much flavor. There could be other factors, too, I’m not sure! I admire beans when using vodka ( you have 6, I’d agree) when using rum I use 3-4 depending on size and type of bean. I also never split the beans so when it runs out I can add more vodka/rum and let it sit. I bake a lot so I normally go through 2 or 3 times before using the bean “caviar” in items. Love it! Info I found on the Internet talked about all distiller liquor being gluten free. The distilling process takes the gluten out of it. But please correct me if I am wrong! While all distilled liquors are gluten free by nature, not all finished products are. Some cheaper whiskeys and bourbons will have a bit of mash added back into the distilled alcohol to improve the depth of flavour. In addition, any alcohols stored in wooden vats, barrels, or casks are suspect unless you have clarity from the manufacturer, as wheat paste is still used in sealing the wood. Contact with the wheat paste is innocuous to non-GF folks, but it means cross-contamination for us. Some information is available online as to which are actually gluten free, but I find it’s always best to contact the manufacturer directly. Most vodka is made with grain. The flavor will vary depending on what grains are used. Potato vodka is your best bet as it is almost flavorless. I have made many recipes of liquor over the years and potato vodka is the best. You can pour any vodka through charcoal and remove most of the off taste. I use the pure water filter , it is a 5 stage filter. Great post! I made some vanilla extract this way and it is delicious. I found a local Iowa brand of organic vodka at Hy-Vee…yay! Which brand? I’m in iowa! I forgot to ask my question! Is it important to get organic vanilla beans? here is the thing I found out in culinary school about many small chocolate producers that also applies to these vanilla beans. Many if not most growers can’t be organically certified, for many reasons, and none to do with pesticides. First is money, depending on size and type of farm it can cost as much as the mortgage on your house to get properly certified. Second is time/documentation of the land, it can take YEARS to get certified, sometimes well over a decade. You also have to prove the land you use has never had disqualifying chemicals used on it in the last 7 years. That leads to the third point, many vanilla and chocolate producers who use third world labor send that labor into untamed lands, forest, jungles, whatever. It can take vehicles and boats, and hiking to get to their source plants (they showed us videos of the chocolate harvest, they canoed and hiked 6 hours to find trees sitting on a flood plain just above the flood waters on a patch of dirt no larger than 5 square feet.). There is no way to prove that has never been touched while at the same time it obviously hasn’t been. all that being said, organic vrs conventional is purely up to your own desires. Remember a few truths about organic, it doesn’t mean GMO free, and it doesn’t mean pesticide/fertilizer free. there are actually organic pesticides and fertilizers that do not negate an organic certification. Always wash your produce. 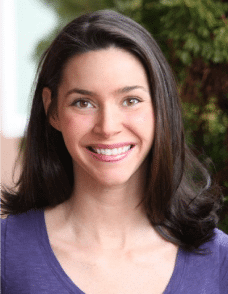 I have been an organic eater and enthusiast for 35 years. I have always trusted that organic is about the only way you can ensure that you are getting non-GMO unless it is specifically non-GMO certified. Why do you say that organic does not mean non-GMO? Since I don’t drink the ‘hard’ stuff, can you explain how the different vanilla extracts are likely to taste when made with the various spirits? I’d like to try this, but want to like it when it’s done! Thanks. I’m a wine girl myself and I’ve only used vodka, so I can’t really say. Maybe someone else will chime in, though. I’m not much of a drinker myself but personally I would go for vodka for most things. If you’ve ever tried pure vanilla extract you buy from the store it taste over powering of alcohol (I found that out when I was a kid trying to make a vanilla coke “like waffle house”). Vodka will have a more neutral taste in the end. Whiskey family alcohol will add some flavor that would muddy up what you’re trying to achieve. That being said, when you use it to bake youll never taste a difference, making icings and other products where the vanilla flavor is prominent, you have a very good chance of noticing other flavors. This might be good, might be bad. Personally as a pastry chef the idea of playing with those flavors intrigues me, but it would have to wait for personal use before I risk a professional blunder. Hello, I am curious about your lovely containers. They look perfect for gifting. Where did you find them? Thanks! So, can you re-use the vanilla beans for another batch of extract? Or do you need to get fresh beans each time you make the extract? Some say you can re-use them, but I have found they don’t create a very strong infusion. I prefer to repurpose used vanilla beans in recipes. This is great! Real vanilla from the store is so expensive sometimes. I will be trying this for sure! I’ve been making home made vanilla for years, using this same process outlined above. It is always delicious and always tastes like the really expensive stuff that one can purchase from places like Penzey’s Spices. 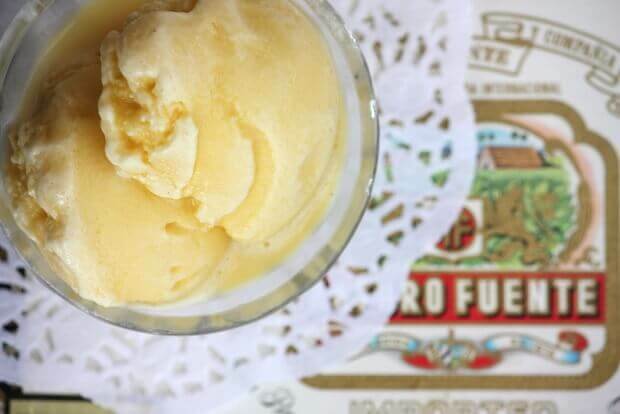 My personal favorite, especially for smoothies and homemade icecream, is vanilla made with Brandy. Brandy somehow makes the vanilla taste more like vanilla. It is reminiscent of vanilla aged in old oaken casks. The idea that you wouldn’t like any homemade vanilla, (at least any with enough v. beans) is relatively funny once you have tasted it. The more likely thing is that you will become such a snob you will never like the store-bought kind again! Regarding ways to use up extra vanilla. Well, it keeps an awfully long time, I would just look at it as something that I did not need to buy for awhile. But if you are really looking…. It is delicious added to a glass of full-fat raw grass-fed milk with a small amount of honey or maple syrup. Hot or cold it tastes like white chocolate cocoa. 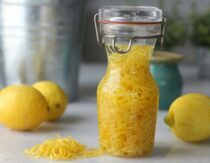 For extra nutrition, add a pastured egg yolk to above and give it a quick whirl in the blender. Talk about silky!!!!!!!!!! being ignorant of brandy, can you tell us what kind of brandy or brand of brandy you use? I don’t have much experience with brandy, so unfortunately I cannot make a recommendation. can you use potato vodka? I’ m in Australia and I love using bunderberg rum. I use the vanilla beans over and over and just leave them in the bottle while using. Homemade vanilla just gets better with age. Great in cake mixes, junkets, icecream, milk, and yogurt. Love simple recipes like this especially when they last forever. I’ve bought vodka and brandy. I’m going to try them both. I have pint mason jars. How many vanilla beans to the jar should I put? I know the recipe calls for 4, but you used small jars. I’m about to head to the store for the organic vanilla beans and making th vanilla tonight. I’m excited!! I started some vanilla about 4-5 weeks ago but it seems like it’s hit a plataue and is not getting any darker. I didn’t split the beans and I do shake it from time to time. And it does smell amazing but I was really hoping for it to turn that deep rich brown color. Do you think if I added more beans it would help the color get darker? It probably would, but I recommend that you taste it first and see how the flavor is developing. Maybe you won’t want/need to! Its been about 7 weeks for me and my vanilla hasn’t gotten darker and it still tastes like alcohol… I also didn’t split the beans..what should i do? You can try snipping off one end of the bean. Bourbon that is sold primarily in the international market is GMO free. Four Roses and Wild Turkey do not use GMO corn. Thanks! Will try that since I can’t get the rum. Am used to being near NYC – in North Carolina can’t buy certain alcohol that I could even buy in Tennessee. what exactly do the three different liquors differ in the final taste of the the vanilla extract? and can i replace one teaspoon for one teaspoon of the store bought vanilla extract and this homemade one? Hey Joyce, the liquors are totally different. Have you ever had Rum Cake? or Bourbon Pecan Pie? Or a Vodka Martini? They all taste very different. Vodka is considered tasteless, but in all honesty tastes like alcohol. At a cooler temp, not as nasty. 🙂 Rum is darker in color and is regional in flavor… meaning each region that makes it imparts its own flavor. While these flavors are nuanced, they are more like burnt caramel and warm wood. Of course each type of rum tastes different. I recommend getting the tiny bottles, like 4 of them and tasting them. Bourbon is delicious and has many different flavors like sweet, leathery, smoky, cinnamon, woody, caramely… etc. each bourbon has a flavor profile all its own… If I were you, I would buy the small 3-4 ounce tiny cute sampler bottles and make extract with those. 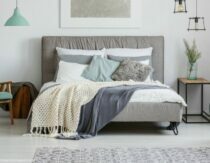 They range in price, but are definitely the cheapest for experimenting! Buy Absolute Vodka, Captain Morgan’s White Rum, Myer’s Dark Rum, Maker’s Mark Bourbon, and Buffalo Trace Bourbon. Make Vanilla with each of these. Then make a small vanilla cookie recipe with each one. That will give you the best idea of exactly how each one will taste in a recipe with the smallest amount of money. As Heather said this would be a really nice gift! Especially if they got a vanilla sampler pack each made with 3 or 4 different alcohols! I’m going to do this too! Happy Extracting! I love this idea! Giving a sample pack of 3 – 4 different vanilla extracts, using the small “airline – size” bottles. Tammy, Heather hasn’t made it without alcohol so unfortunately she cannot say whether it would turn out well or not. You need the alcohol to extract the properties of the bean. When you cook with it the alcohol content disappears if that is your concern. I pinned this one on Pinterest! I used it to make Christmas gifts this year. I got the variety pack of beans, and tried each of the different types of alcohol. My favorite? RUM! Hello! I have a quart sized ball jar that I used to make vanilla. I left the beans in the jar and have been using it a little at a time. It is about half way gone now. The last time I tried to use it, it smelled so strongly and tasted so strongly of alcohol. What would cause this to turn back from vanilla to a more alcohol taste? Do I need to just add more beans and fill it up with vodka? Or should I start over completely? What do I do with the liquid I already have in there? Thanks for the help! Hi Julie, I’ve not heard of this kind of issue before so unfortunately I’m not sure what to advise. Sorry I can’t be more helpful! add more beans and shake the jar occasionally especially before use. I would expect what is happening is something akin to settling. The flavors being extracted from the beans are likely the essential oils, or fats, of the beans. Given time and enough rest the flavors would naturally rise above the alcohol. It would be a slow process though, and the bigger the container, the more agitation is needed to properly mix the flavor. Is it better to use a dark color bottle? Only if you’re not keeping it in a dark place on its own. Last year I decided to make my own vanilla extract. I walked into the liquor store 8 months pregnant and told the cashier “I need the biggest bottle of your cheapest vodka.” He just stared. Does anyone know what exactly do the three different liquors differ in the final taste of the the vanilla extract? Thanks. 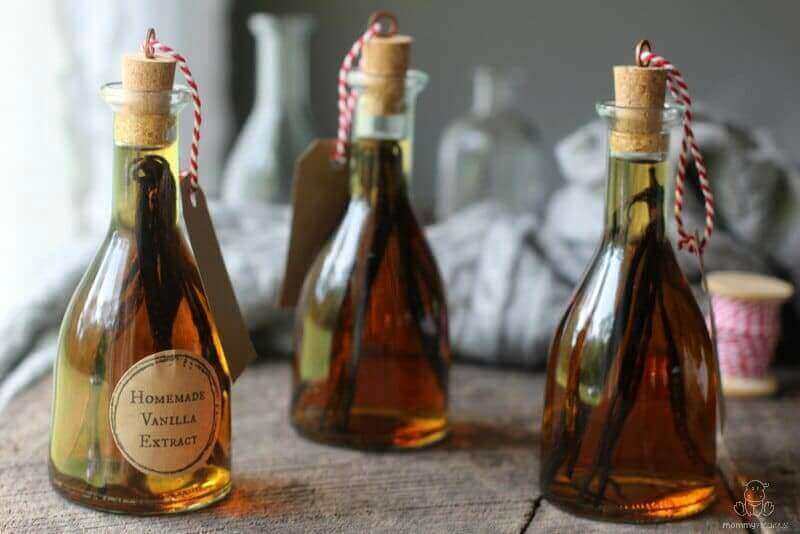 Hi, Can i share How To Make Vanilla Bean Extract on my facebook? Hi, I have been making homemade vanilla extract for years now. I made it with rum and it wasn’t quite the same as with vodka. If you go into http://www.beanilla.com you can find good vanilla beans and neat bottles. I make mine with 6-8 beans and 8oz of a good vodka. Store in a dark place for 2 months and shake now and then. Yum! Has anyone ever reused the vanilla beans for another batch of vanilla extract? I was wondering what size bottles you used and where you got them from? I love them. Hi Heather 🙂 thanks for the In depth GMO info on the booze. Question: can the Unsplit vanilla bean be reused after the six week soaking time or will it not yield enough flavor to do another batch? Thanks! Where can I purchase those bottles with the cork? Great idea, thank you for posting! 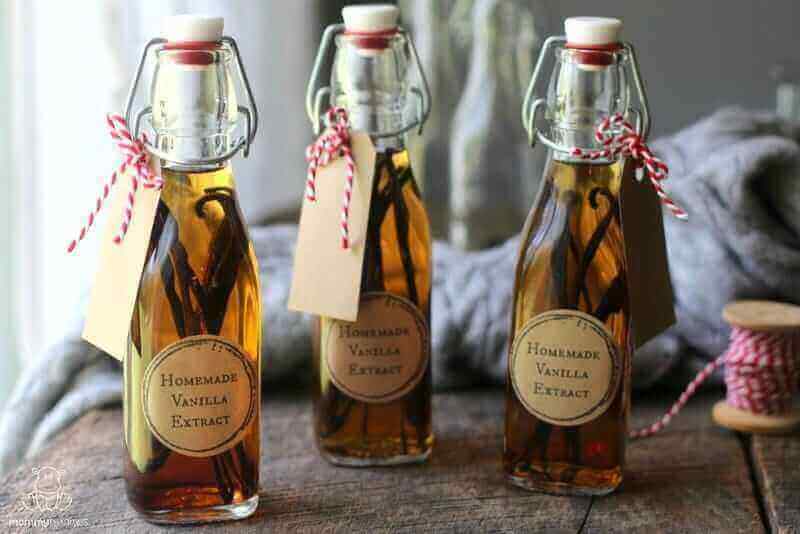 Do you leave the vanilla beans in the bottles when giving as gifts? Also, if you make the vanilla extract in the actual vodka bottle, then pour into ‘gift’ bottles, you will not have any beans in the gift bottles, correct? Heather, if I’m making 4 oz bottles as Christmas gifts, how many beans would you suggest? Could I get away with 2 beans if I suggest leaving it an extra couple weeks before using it? 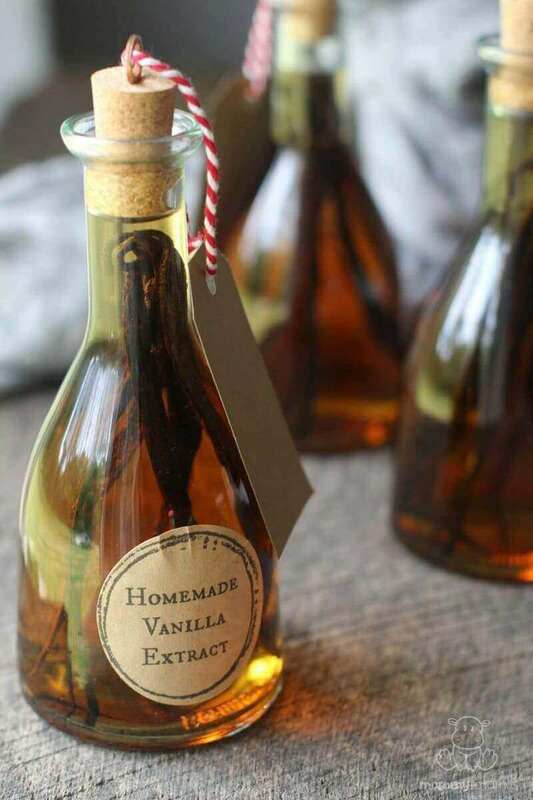 I am just wondering how your 4oz bottles of homemade vanilla turned out? I am wanting to do the same for Christmas this year and wanted to give them in 4oz. Also, did you use vodka and approximately how much was your total cost per 4oz bottle if you happen to have calculated that part out?! I made some several months ago and didn’t quite completely cover the beans. Maybe less than a cm exposed. Does that pose any sort of problem? Can you suggest where to buy vanilla beans. The link for Amazon says it’s currently unavailable. Yes, would like this info as well! Bummer, looks like the place I usually buy from is out of stock right now. I think I’m going to order these this year. There’s a global shortage of vanilla beans which is why the pure extract and paste have skyrocketed in price and some shelves are bare of the bean. Off topic – I read a cookie recipe recently (Jacque Torres) which called for one cup of water but to halve that and add a half cup of vodka. The alcohol won’t be a factor and this lessons the gluten and helps what gluten is in the dough to relax making it softer. Has anyone tried to advance the infusion by putting the in a vacuum chamber? I just returned home (Pittsburgh) from Madagascar where it was explained to my tour group a recent large crop of vanilla bean was destroyed. Mada is well known for the best & largest amounts of vanilla growth world-wide, hence Amazon and others being sold out. Local prices here at home have exceeded $27 for store bought pure extract because of this reason. While I purchased eight grade B beans at $3 American dollars each, I wish I had brought home more. Requesting beans from a reputable “spice” enthusiast in Mada may be the way to go. Weight is extremely low for postage. They will arrive individually wrapped in cellophane to preserve freshness. These folks are extremely proud of their product and more than willing to sell at a very fair price especially following the bad season they endured. Good luck and happy extracting! A question for you? Why when I open your articles the page keeps scrolling up very slowly? I receive tons of healthy emails I have never come across this problem. Hi! I made this for Christmas two years ago and forgot to give it away – so it’s been sitting in my dark cabinet, beans still in, for almost two years. How long will it stay good? It’s probably amazing vanilla extract, if I can actually use it! Need advice, please! Thanks!! This past Thanksgiving we made our deserts using vanilla extract I’ve had over 10 years and every thing was great. We used it up, but luckily I made some more about 3 years and can’t wait to start using it. thanks for the recipe! the 40-bean pack is no longer available..i’m wondering if you’ve found another source for the beans? thanks! If u do a tiny jar how many beans per jar?? I like the idea of a sample pack! I made vanilla extract and I see little white stuff floating in it. Is that part of the process? It’s only been 5 days. I can not find any information on it? What will happen if I use less vanilla bean, per bottle? The price of them is way up right now. Would it make the vanilla weak? Could I get by with using less than 5, per bottle? Has anyone tried using less vanilla beans per recipe? You can use less but as you guessed the flavor will not be as robust. I love your packaging designs for the vanilla thank you for sharing them! I am looking at your links for the bottles you use and they weren’t available on amazon last time I needed them! THanks again. No but that sounds wonderful!